Here is my breakdown of the hand. Cunningham’s $10,000 opening bet with K-Q on the button was natural, although most players would have opened for $12,000 or $14,000 (a raise of about three times the big blind is the current standard). Ivey’s reraise was fine as well, and I liked the $30,000 number. Ivey also could have called or even folded his hand. Ideally, I would have liked to see Ivey stare down Cunningham for at least 10 seconds before he made his reraise. This would have accomplished a number of things. First, it would have allowed Ivey’s instincts a better chance to sort out whether A-6 had Cunningham beat or not. Second, it would have let Cunningham know that Ivey was paying close attention, and possibly caused Cunningham to fold his hand, which was the more natural play for Cunningham to make in this situation. And finally, it may have allowed Ivey to make a super-genius call with A-6 for his last $72,000. Greenstein’s fold with A-J was pretty much mandated here, even though it turns out that he had the best hand. After all, it is pretty tough to move all-in with A-J when you’re staring down a raise and a reraise. Cunningham’s all-in move here was brilliant. He put it all on the line with this gambit, and he put tremendous pressure on Ivey. With this all-in, he forces Ivey to fold any small pair, any ace high other than A-J or higher and possibly forces Ivey to fold a medium to big pair, like 10-10, 9-9 or even J-J (although I think Ivey would have called with J-J). 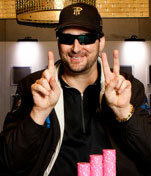 And let’s not forget that Cunningham also wins the pot if Ivey was bluffing. What was brilliant about Cunningham’s move? He correctly deduced that Ivey couldn’t call an all-in move. If Ivey had A-K, A-Q, A-A, K-K, Q-Q or J-J, then I would criticize Cunningham’s move and say, “How could he risk it all there with K-Q?” But Ivey had A-6, and no-limit hold ’em is a game of reads, deduction and logic. Cunningham read that Ivey couldn’t call a reraise, and he acted accordingly, moving all-in. Ivey’s fold allowed Cunningham to win $34,000 (Ivey’s $30,000 raise and Greenstein’s $4,000 big blind) risk-free. One more reason that Cunningham could make that move is that he had a tight reputation that day: He was playing fewer hands than anyone else. In fact, Ivey couldn’t even imagine that Cunningham had K-Q, as evidenced by Ivey’s super-quick fold. I think that Ivey’s fold for $72,000 more was an easy and natural fold to make. Ivey would have had to make a “superstar” play to call there with A-6. Why do I criticize the exact same move one time, and heap praise on it another time? Am I results-oriented? Partly, but I’m more “read-oriented.” If you read someone well, and act accordingly, most times it is a good move in my book. If you read someone poorly, and act accordingly, most times (even if you get lucky and win the pot) it is a bad move in my book. C) Make a great call.